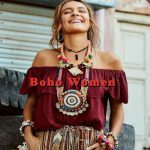 Boho is a style of fashion, makeup, and hair which draws on various bohemian, gypsy, hippie, steampunk, western, eastern, country, and orient influences as examples. Emphasis is put on freedom of attire, hair, and makeup. There are exceptions such as the Boho Bride who occasionally may be a little more formal. Boho is a wonderfully versatile style which adds charm, beauty, freedom of expression, and sophistication. Become a member and join us today!